Corbin Bullet Balls are made of linear polyethylene and provide precise weight filler for jacketed bullets, or act as a tip. The use of a bullet ball within a jacket fills the volume with low density material, which lets you make lighter bullets in jackets that normally would hold too much lead core for the weight. You can make ultra-light bullets of normal length, and make them stable with a slightly forward-of-center balance point. 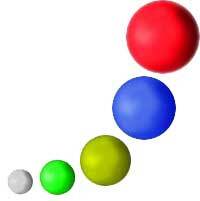 Bullet balls also let you adjust the balance point of a bullet at will by using either two cores on either side of a bullet ball, or two bullet balls on either side of a core. The ratio of the core lengths will determine the bullet center of gravity. When placed over a hollow point cavity, the bullet ball can be seated so it acts either like a piston on impact, compressing air in the cavity and expanding the bullet dramatically, or the jacket tip can be rolled over the ball, so the ball acts like a roller (think of a ball point pen) to assist feeding into the chamber of autoloading pistols. Bullet balls are color coded by diameter, and packaged 1000 to a bag. The catalog numbers here are shown as BB-1-8 for BB-1/8 because the webstore software doesn't allow slash marks in the product code! In the print literature and normal text the diameter is listed as a fraction for each size of ball.